Today’s post was going to be Moroccan Lentil and Vegetable Pasties and a deliciously tangy Tabouli. I say was, because unfortunately, I hated how the photos turned out so I won’t be publishing them today. I will however remake the pasties (which have since been devoured) and the tabouli (which my fiance adored) as I really enjoyed both and want to share the recipes with you. The photography side of food blogging is the part I find most difficult. There are so many wonderfully talented food blogger photographers, who style their photos so beautifully that they look like the pages of the best food magazines, that often I can’t help but feel quite inadequate in comparison. I look at the amazing photos from these talented photographers, with awe and admiration, and then read up on how to improve my photography. The problem is, it seems, the more I try to work on improving the less I like the resulting photos. Instead, I find I like my photos more when I simply throw things on the table and look through the viewfinder of my camera and go from there, adjusting as necessary, rather than trying to follow the rule of thirds and other photography rules. While my photos won’t be winning any styling awards, I do hope that my photos do entice you enough to want to try the recipes you find here on Delicious Everyday, because that really is my ultimate goal when I take photos of my cooking to share with you. Now, onto the Lemon Tart. I made this Lemon Tart yesterday, and burnt my hand in the process 🙁 spending the night with an ice pack strapped to my right hand :(, but it was worth it. 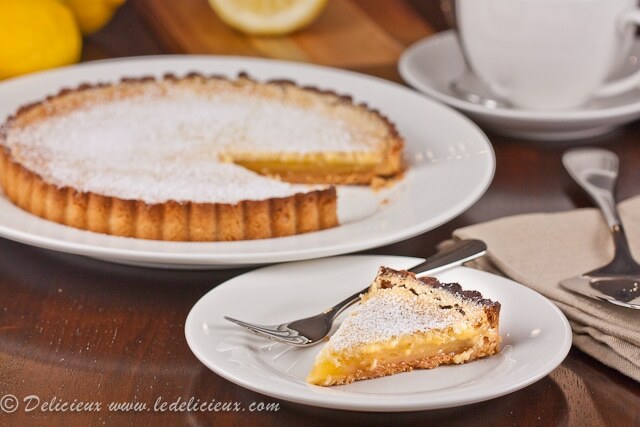 When I think of lemon tarts I want that mouthpuckering lemon tang, and this Lemon Tart certainly packs a punch in that department, which I love! This recipe, is actually a combination of two different recipes. 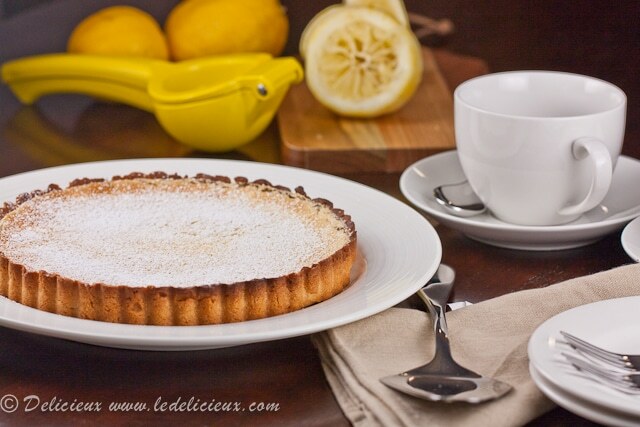 The filling for the Lemon Tart comes from a lemon slice recipe by Belinda Jeffrey. 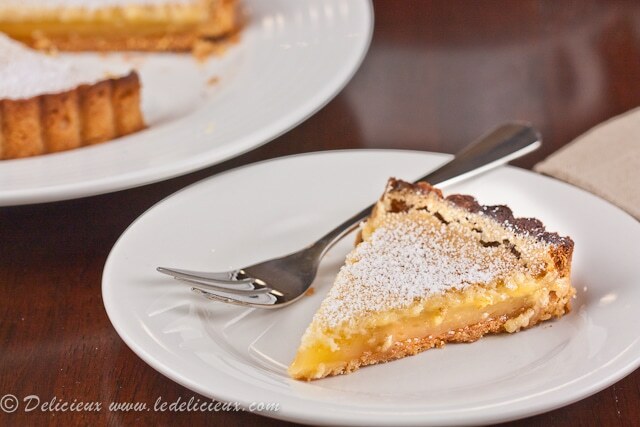 I’d made the Belinda’s lemon slice a little while ago, and while I adored the filling I didn’t like the base as I found it too soggy and a bit bland. Because this Lemon Tart filling is so soft that it melts on your tongue I wanted a crisp base to provide contrast and a bit of texture. For the base, I turned to Dorie Greenspan’s trustworthy sweet tart dough. I’ve tried many tart dough recipes and in my humble opinion Dorie’s is the best. It’s easy to prepare and more importantly doesn’t shrink when baked (as long as you following the chilling times). So tell me, do you like a lemon tart that delivers that mouthpuckering tang or a more subtle lemon flavour? Congratulations to Joanne Flower, the winner of the Scanpan Knife Set Giveaway!!!! I contacted Joanne yesterday who is excited and can’t wait to receive her prize. Well, Joanne, you won’t have to wait long because the amazing people at Kitchenware Direct have already shipped your prize!! You should receive it in the next day or so. There were a whopping 458 entries, so a big thank you to all who entered! Keep your eyes peeled for another giveaway coming soon. Makes 2 tarts. If you want to make 1 tart you can safely scale down the filling, and freeze the unused portion of tart dough. Tart Dough recipe from Baking: From My Home to Yours. Filling from Belinda Jeffrey's Mix & Bake. Add the ground almonds, salt, vanilla and process until smooth, scraping down the sides of the bowl as necessary before adding the egg and processing until combined. Preheat the oven to 180 degrees celsius (350 Fahrenheit) and line the tarts with baking paper and add dried beans or pastry weights and bake for 20 to 25 minutes until lightly coloured. To make the filling, preheat the oven to 150 celsius (300 Fahrenheit) whisk the eggs and caster sugar in the bowl of an electric mixer until well combined. Whisk in the lemon zest and juice before sifting the flour over the top and whisking until smooth. Pour the filling into the prepared tart cases and bake for 20 to 25 minutes, or until the top is set. Wow, what stunning, but so easy, recipes I have found. Thanks so much. Your blog is very pleasant to look at ! I love tacting photos for my recipes, but I admit some recipes are more photogenic than others ! Mmm I love a good lemon dessert — your tart looks perfect! Isn’t it sad when something that taste so good just doesn’t happen to be that photogenic at all and we keep trying and trying ! Things we do for our love for blogging. As for this tart … you got my attention dear and I love lemon tart. This is now in my wish list. amazing space you have with gorgeous posts.. Lemon tart is one of my all time favourites, it looks very similar to a recipe i make. Your photography is stunning, i am shocked to hear you question it! and the pasties sound really delicious. Yummy! This is one of my favourite desserts ever and it looks soooo delicious! Your pictures are always pretty and could very well be featured in a magazine, but I agree with you, this is one of the most difficult part of blogging. There is one thing that I find personnally conforting: looking back at my own early blog pictures, which makes me realize that even if I am very far from taking professional looking photos, there are some improvements…. Aww you are so sweet 😀 Thank you. This tart loks perfect! I love lemon and I agree sometimes you have to find the base for the perfect filling. Thanks Ellie 😀 I think your photos are stunning too, all of your food looks so good. You def sell yourself short in the photography department. Iwas just thinking the other day how I admire your styling as it always looks so effortlessly great. Awww thanks Nic 😀 That is so sweet of you to say that. And I hear you about photography. I think it’s the matter of practice and get used to your camera, and the space you have for organising stuff. it’s a bit of trials and errors, dont you think? Looks delish. Have to agree, I like your photos and look forward to seeing them. Surprising how we underestimate ourselves. Your photos looks great 🙂 it doesnt matter how you photograph it’s the taste that matters!! Is looks like a great recipe and I love a good lemon tart so I’m going to definitely try this over the weekend!! You’re right Jo, it’s that taste that matters 🙂 If you make the tart let me know what you think of it. You don’t know how many drafts I have sitting in blogger- never published because the photos just didn’t turn out the way I envisioned. But I like going with the your attitude that your main aim is for people to cook your food. And this tarts looks fab 🙂 I’d bake it for sure! Thanks Sukaina 😀 It’s funny to hear you have drafts of things you’ve not published because I think your work is so beautiful. I guess we are most critical of ourselves. Lovely tart. I’ve made it from Dorie’s book a few times. As for the food photography part – you are doing a fantastic job and practicing, learning is all you can do to improve. The rule of the thirds is a good think to know and keep in your head but do not drag your creativity down but following the rule exclusively. I have it in my head but keep myself free from it when styling – it’s your creative freedom and let that come out! ;o) And if you want to feel better – have a look at my photos from the earlier days (2007 for example). You’ll feel better and see you are on the right road. Hugs! A wonderful tart! That is one of my favorite desserts. The photography part is the one I also struggele with, but I’ve just accepted the fact that food styling is not my thing! But you know what I enjoy most about food blogs, the recipes they post. I find that the blogs whose recipes I actually bookmark tend not to be the most stylised. Even though I personally think your pics are definitely NOT amateur, your blog is one of the ones I bookmark the most recipes from! Thank you so much, that really means so much. I am so glad you enjoy the recipes I share and was SO flattered when you made my mushroom, spinach and feta pies 🙂 And I don’t think you struggle with photography, your photos are beautiful! First time here, and you know what, your photography entice me to follow you! I think your photos are stunning, and what matters most is the recipes are genuine, you have a seriously mouthwatering collection here, keep up the delicious work! Thank you so much Jehanne 🙂 Your blog is gorgeous too. ps – all of your pics are awesome. who cares what the photo peeps say. i like that you have your own style! i LOOOOOOVE anything lemon! i made a lemon tart years ago and got compliments on it but never made it again. i should! i love the powdered sugar. Yummmm… Looks great I love anything with lemons!